We provide a High Level Cleaning & Maintenance service as well as roofing and chimney repairs. We have a 1 hour emergency response throughout Sussex, Surrey and Kent. Identify Drainage & Plumbing provide domestic and commercial CCTV drain services across Sussex, Surrey and Kent. With over 25 years experience there is no job too big or too small, or too high in this case! 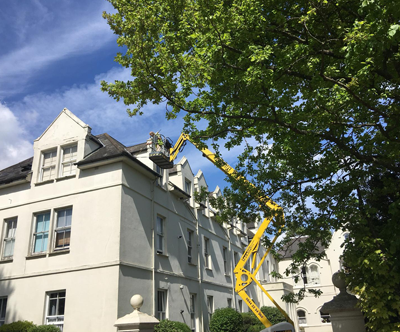 Our engineers at Identify Drainage & Plumbing are fully insured and trained to drive our cherry pickers giving them access to identify, clean, clear, repair or replace guttering, roofing, chimneys or any other problem that is too high or dangerous to reach. Call Jim or Claire now on 07500 438383 or 01342 810840 for advice and availability. 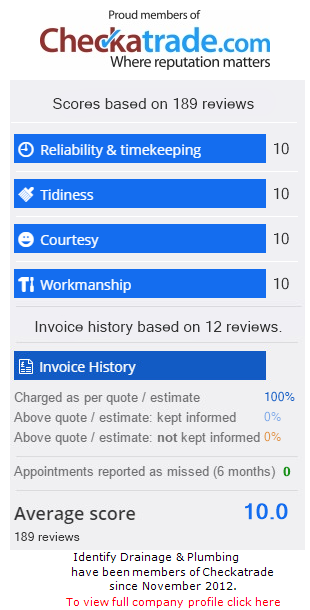 Identify Drainage Services is a family run independent business which prides itself on keeping its customers happy. We identify the problem, respond and resolve the situation quickly and efficiantly, keeping everything hassle free and cost effective. © 2018 All rights reserved. IdentifyDrainage.